Full Kit (360 kit shown in picture). You can now see the refugium nano running on youtube... The Refugium allows the removal of phosphates and nitrates within your system... With the help of a little caulerpa or similar for marine and elodea or similar plants for freshwater. The Refugium allows the removal of phosphates and nitrates within your system. The Refugium will allow a Breeding Ground for small Critters to thrive... Feeding the aquarium inhabitants in the process. 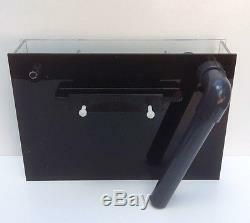 Refugium Nano, Spray Bar, Piping, Mineral Mud (Caribsea), Coral Sand, Pump and LED Light. CaribSea's Mineral Mud is an unique blend of sediments that duplicate tropical fringing costal mangrove environments. Mineral Mud is in a size range campatible with soft, burrowing infaunal, marco animal assemblages. Ideal for mud refugiums, seagrasses, macro algaes, and mangroves. Mineral Mud provides a variety of trace elements, chelated trace elements, natural bio-available iodine, plus calcium, strontium, iron and free carbon. Cleartides Refugiums are designed to hang-on the side or back of an existing aquarium. 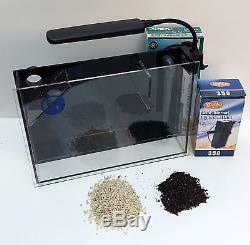 Freshwater : 50 gals / 200 l. Width (front to back) : 70mm. Depth (top to bottom) : 200mm. The item "Cleartides Refugium Nano (160l). Full Kit" is in sale since Friday, June 03, 2016.